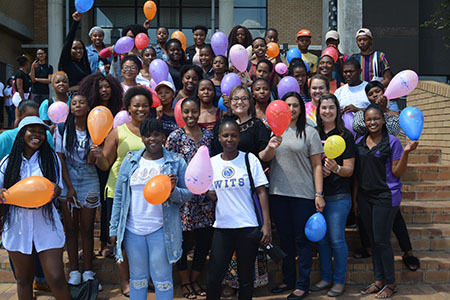 This is how Tracy Mkwanazi, junior lecturer in social work and guardian of the Social Work Student Association (SOWASK) on the North-West University’s (NWU’s) campus in Vanderbijlpark, explains the nature of the student association. SOWASK recently mobilised the campus community in a march across the campus in celebration of International Social Work Day. The profession faces many challenges and SOWASK hoped to pay tribute to every social worker in the field who is touching lives and making a difference despite these challenges. Eager to march… some of the participants in this year’s SOWASK march in celebration of International Social Work Day. The march started in front of the campus library and ended at the student centre. More than 100 students, dressed in bright colours and holding brightly coloured balloons, took part in the march. Although hosted by SOWASK, the participants were from all walks of campus life, representing student bodies as well as academic and support staff. SOWASK could really relate to the theme of International Social Work Day 2019, namely “Promoting the importance of human relationships”. “We realised that even though our campus promotes diversity, people still tend to isolate themselves within this diverse environment,” Tracy explains. SOWASK sees their mission as building a solid foundation from where everyone, irrespective of gender, race or sexuality, can express themselves without feeling judged. Their main aim is to work towards a campus environment where everyone fits in.